The St. Clair County Sheriff Office is committed to the values of integrity and honesty in our interaction within the community. To proactively aid in the prevention of crime, we will study and employ modern law enforcement techniques and embrace leading edge technology proven to safely and effectively administer our daily activities. Welcome to the website of the St. Clair County Sheriff’s Office. We invite you to browse about, to learn the history and capabilities of the department. The Sheriff’s Office provides law enforcement and other services to over 720 square miles of land, along with more than 110 miles of shoreline. 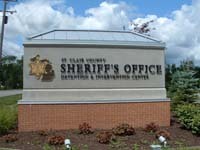 The Sheriff also provides the constitutionally mandated services of the jail. The Intervention and Detention Center campus also houses the St. Clair County Central Dispatch Center.